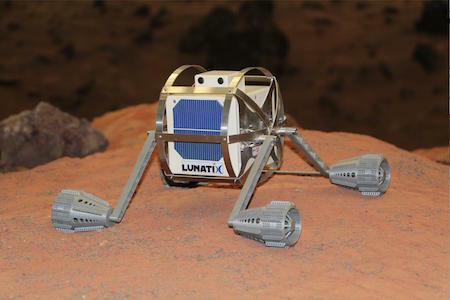 The Lunatix moon rover is a crowd-sourced project to put a small four-pound rover on the moon and then let users of an online game move it around our only natural satellite. The project, called Lunatix, is currently in the planning stages. If all goes according to plan (the team still has to figure out a way to fund the initiative), they'll have a working model on the Moon in the next four years. 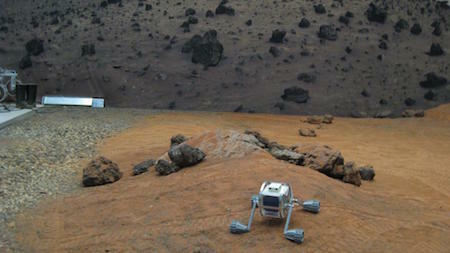 Players will be able to drive a nanobot—a three-pound, four-wheeled rover—across the surface of the Moon through a video game on their home computer. Players would also be mapping out parts of the Moon that have never been explored by humans. According to Jorge Fiebrich, engineer at the European Space Agency and one of the founders of project Lunatix, he and his colleagues turned to the international gaming community because of the huge amount of users, and because of the potential revenue source for their fledgling business idea. PC gaming revenues are expected to reach $29.4 billion in 2017. Fiebrich and his team consulted gaming companies, including Valve, the creators of Half-Life and the gaming marketplace Steam, and told me that they were very interested in their idea. "We ran interviews with scientists, gamers, and random users we met and the feedback we got was overwhelming," Fiebrich said. "People would love to actually control real hardware which is out there in space. It was just so overwhelmingly welcomed." If this seems familiar to science fiction fans, it's because you've seen it before! "Meet Rachel Lief," Lunan said. "Ms. Lief is a bulldozer driver." Lunan paused for effect. "As you see, Ms. Lief doesn't look like your typical tractor driver..."
"But then," Lunan said, "not every bulldozer operator works on the Moon." The cameras followed the trim woman into another room, where there was a replica of a large tractor. It was surrounded by TV screens. One screen showed an astronaut sitting in the driver's seat, staring impatiently into the screen. A bleak, nearly colorless pit showed over his left shoulder. "About time you got here," the astronaut said. I'd also direct you to the entry for the teleoperated beetle cars from James Blish's 1951 tetralogy Cities in Flight. Via Motherboard and Lunatix abstract (pdf).